Do you like surprises? We sure do, and Samsung treated us to a nice one during the official Galaxy Note 3 unveiling. Along with its newest high-end smartphone, the company announced a totally overhauled version of its S Pen-equipped Samsung Galaxy Note 10.1 tablet – fully loaded not only under the hood, but also in the software department with many of the productivity tools found on the Samsung Galaxy Note 3. Naturally, a tablet so capable has to be stacked up against the best of the best, and one of its most fierce competitors comes from Apple's camp. That's the iPad 4, of course, which still ranks among the top tablets on the market even though it has been almost a year since it launched. 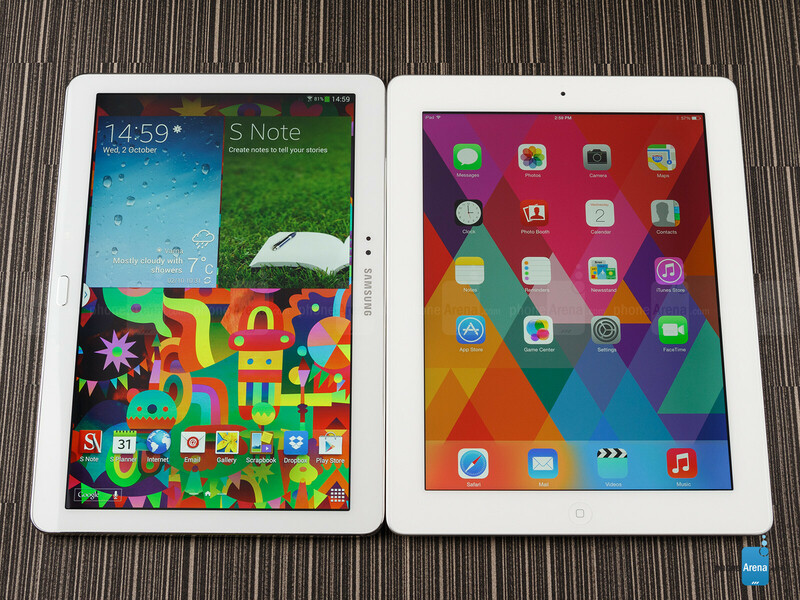 So yeah, it is Apple's finest against Samsung's greatest tablet to date. Has the Korean company finally managed to beat its rival on the tablet front? Let's find out! When it comes to build quality and construction, the Apple iPad has always stood in a league of its own. And the current model is no exception – it is still that extremely sturdy, well-built machine millions of people use and love. Everything about the iPad 4 screams “premium” right at your face, from the solid, aluminum back plate and the shiny Apple logo at the back to the meticulously crafted physical buttons and the perfectly fused seems around the device's edges. 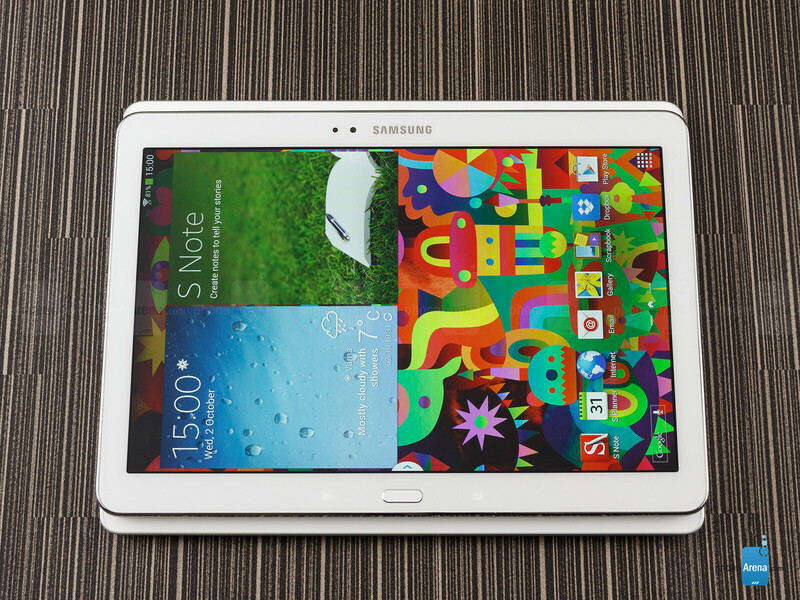 As for the 2014 edition Samsung Galaxy Note 10.1, the tablet is definitely better-looking than its predecessor. However, it is still no match for the iPad 4, not when it comes to design. Its leather-like back looks kind of fancy, but it is clearly made of plastic, as our fingers can instantly tell. 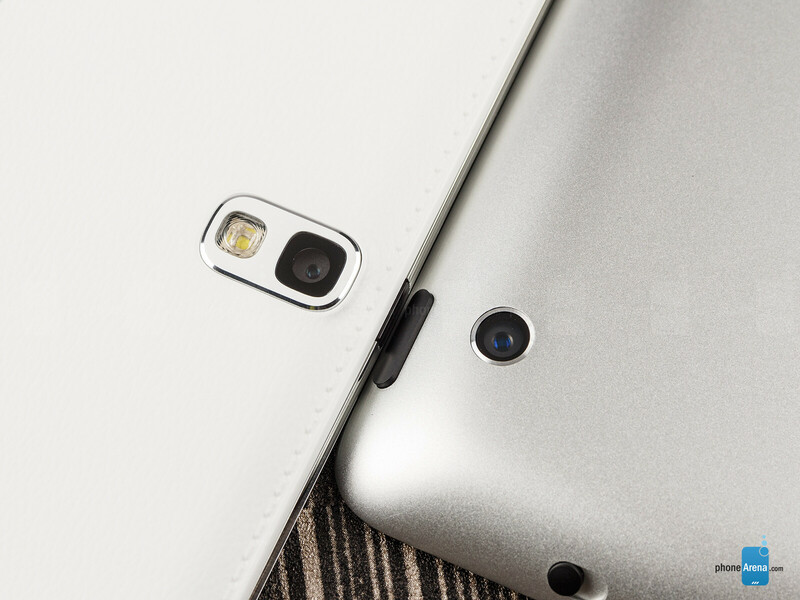 On the other hand, the new Note 10.1 tablet is thinner and much lighter than the iPad 4. It weighs 547 grams and has a thickness of just 7.9 millimeters, while Apple's 9.4-millimeter-thick tablet tips the scales at 662 grams. That makes Samsung's 2014 Note 10.1 highly portable and slightly more comfortable to hold. Another advantage for the Samsung Galaxy Note 10.1 (2014) is that it comes bundled with the S Pen – a very precise digital stylus sensitive to pressure, used for taking down hand-written notes and much more. It sits in its dedicated slot, located on the tablet's side, so it is always with you whenever you need it. Sure, a significant number of users might never really need the accessory as it is far from the fastest thing to write with, but we're pretty sure some creative individuals will be quite pleased with the possibilities it enables. Ultimately, the 2014 Samsung Galaxy Note 10.1 stands out with being lighter, thinner, and loaded with an S Pen. 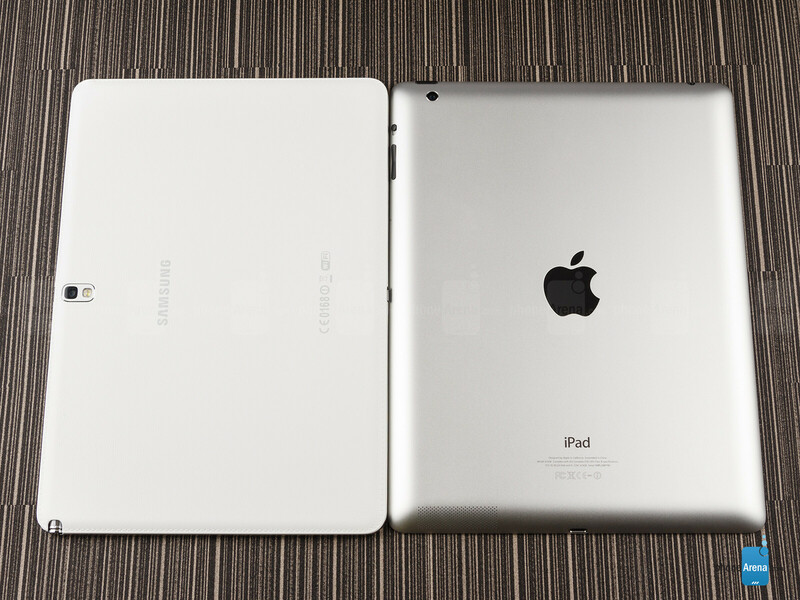 However, it lacks the visual appeal and quality of construction that places the iPad among the top tablets out there. Screen quality is of utmost importance for any tablet, and we're glad to say that neither the iPad 4, nor the Samsung Galaxy Note 10.1 2014 edition disappoints in that respect. Apple's slate uses a 9.7-inch IPS LCD “Retina Display” with resolution of 2048 by 1536 pixels, while Samsung's offering comes equipped with a 10.1-inch Super Clear LCD panel with resolution of 2560 by 1600 pixels. When it comes to pixel density, the new Note 10.1 tablet has the upper hand with its 299 ppi, but in reality, the iPad 4 screen, at 264 ppi, is just as detailed to the naked eye; we'd describe the difference between the two as negligible. Anything from text to images and videos appears clear and detailed on either of these tablets' screens. Colors are represented very accurately on the iPad 4, while shades of green and blue displayed on the 2014 Samsung Galaxy Note 10.1 are a bit too saturated. That isn't too major of an issue, however, as an untrained eye will not spot that imperfection easily.. On the other hand, Samsung's tablet has better viewing angles, remaining clearly visible even when looked at from the side. Outdoors, both screens are usable, as long as the sun is not shining straight at their screens. While we're at it, we must note that the iPad 4 screen has an aspect ratio of 4:3 – proportions that make it ideal for looking at photos. Movies that haven't been trimmed to match the tablet's screen, however, will not fill its entire area. The display on the Samsung Galaxy Note 10.1 2014 edition has an aspect ratio of 8:5, so it is more suitable than the iPad's for watching those wide-screen movies. Nice tab from Sammy but my money is still on the iPad. Apple may have repetitive designs, but at least they're GOOD designs. And, I agree the color palette on iOS 7 isn't very good, but everything else about it is a very nice update from iOS 6 (aside from the bugs, but those come with any major OS update). When Android gets better tablet app optimization, then it will be a better match for iOS in the tablet space; that's really the only thing that's missing from Android. My big issue with iOS 7 is that I've always thought iPads and iPhones have a very classy sophisticated design. And even if iOS 6 took skeumorphism over the top, they matched. Now iOS 7 doesn't look like something that should go on them! They clash. The color palette's kind of weird but would look good enough on something else. But when you have a gold and white phone, why is the OS neon? I agree. Android tablets are still behind to the iPad. Massive factor is that simplicity iOS is in tablet form than Android. vlc? The video transfer over wifi is as fast as by USB. What?You Can't transfer Files To your iDevice,It's Hard?It's exactly like transfering files to an android device,But you just have to have the iTunes,Simple..
android didn't need any specific software or any synchronize.. just drag n drop.. you can see which one more simple right???? Are you dense or something. I own an ipod 4 updated to ios 6.1 and god I love the device but hate the retarded itunes. I had to discover how to CHEAT itunes into letting me put my music library real player already had on it onto the ipod. Ow yet it is simple. Then came new computer it keapt telling me to basically put wipe tge ipod clean so it can be set to the new pc. I had to jailbreak the damn thing to get it set to new pc without wiping my games and music. Ow but it is SIMPLE do you even know what your talking about? Drag and drop and no wipes needed to install usb drivers to new pc with my galaxy s2 4g I am tech savy but that dont mean I want apple to put me on adventures just to keapt my music libray. Why should I wait an hour to wipe it all than wait an hour for it to resync to the account and put ALL the SAME things back on. This isnt a matter of it is simple or if your tech savy. No its a matter of the fact it is retarded and poorly thought out. Or is it apple makes it so hard to force you to buy an imac and use itunes. Yea it is the latter sorry but it is obvious. So apple why DO I have to use itunes or get and imac just to have full functionality and ease of use. Ow you like money sorry forgot me as a acustomer doesn't matter sorry I forgot that. I still own and will always own this ipod it is GOOD but the services and company are pure crap. End of story. So yes I hate aapple and no I dont want an ipad or iphone this ipod was enough of a headache I rather android phones and linux pc's thankyou bye bye now. I like the Samsung, but for tablets it will be Apple for quite a while, iPad still has the best quality and quantity of optimized apps, but I must say Samsung and Amazon are doing great jobs to make Android tablets more usable. Apple is way behind. And now they are behind in tbe tablet marlet as well. Apple is going to need a lot of work if they are going to even think to keep up with the competition. But seriously, the features and harware make this note 10.1 like 10 times better than the ipad 4. This puts the ipad 4 back to the 4th best tablet on the market. And its a big gap. I am not an apple fan, but between the two, I would go with the IPad as I prefer better build quality and materials that are offered by apple and other companies such as HTC, Sony, etc. Yea but the note 10.1 is a way better tablet. You are crazy to buy an ipad over this. The ipad is most basic thing around now. The Note is so much more than just a large screen, it's all about UTILIZING it. Split and pop-up multitasking, productivity and creativity with the pen, multimedia-friendly screen ratio, higher PPI, smaller body, better camera, faster CPU, more memory, IR blaster with TV abilities, microSD slot and the more versatile OS. The iPad has an equally great screen, good responsiveness, better battery life, more dedicated apps but it's just way too heavy due to it's solid build. Both batteries charge insanely long, wonder why don't they just split them into two and have two circuits charging 2A each. My iPad4 seems to charge quite fast on iOS7, it's faster than my old GS2 at charging, not a patch on my GS4 though. I still love my iPad 4 even though we have had it for a while. I'll surely try out the note 10.1 to see of I can get over the fact that tablet apps are lacking in play store compared to the app store. They should keep the stuff like multi-window and most of the S-Pen features. Everything else needs to go, though. Unless IOS 7 has fundamentally changed the counter-intuitive nature of IOS, I'd rather stab my eyes with a hammer than use a device running it. I hate having to constantly stop myself/correct myself from doing the logical thing to accomplish something, like back up a step or exit the current application. Biased as normal. I dunno why I even bother to read these anymore... SMH just like yesterday and the Note 3 iPhone comparison. I sensed damage control in the review. Still not ready to break up with beloved apple I suppose? Haha Productivity is the key. Grow up, you don't need a toy ipad that can only do so much. Am I the only one here who thinks that a chunk of metal doesn't look premium, especially if it is thick and silver? no you're not the only one.. because the majority of people those thinking like you just remain silence including me.. cause we know lots of people in this world including authors of this site still thinking that alumunium is better than plastic..